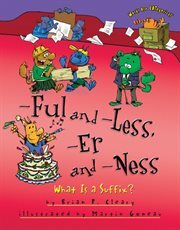 The item -Ful and -Less, -Er and -Ness : what is a suffix?, by Brian P. Cleary ; Illustrations by Martin Goneau, (electronic resource) represents a specific, individual, material embodiment of a distinct intellectual or artistic creation found in Austin Public Library. Rhyming text and colorful illustrations present numerous examples of suffixes. true-Ful and -Less, -Er and -Ness : what is a suffix? Appeal Terms of -Ful and -Less, -Er and -Ness : what is a suffix?